Fancy a weekend away in some of the prettiest countryside south of London? Thinking of holding a business gathering away from, but within reach of, Heathrow (and for that matter Farnborough if your contacts are coming in by private jet)? Or looking for a pleasant night-stop on the way to Southampton to pick up a cruise ship? Our venue answering all the questions was the Four Seasons Hampshire, an international standard luxury hotel set in rolling parkland in a very quiet part of rural England. The M3, just five minutes away, seemed another world. Based in Toronto (Canada) and established in the UK with high quality properties in London’s Park Lane and Canary Wharf, Four Seasons some years back decided that to add a country house hotel within reach of Heathrow might be a good commercial idea. In 2001 the Dogmersfield Park estate was purchased. Any renovations on the site had to meet two criteria. Those of English Heritage and, just as critical, those of Four Seasons to its very high standards. The hotel opened in February 2005 with 22 guest suites and 111 rooms all distinctive and meeting 5-star plus standards. Dogmersfield Park Manor House was built in the early 18th century but the estate as a whole – some 500 acres where wild deer still roam – goes back to the 11th century. The land is in fact recorded as “Doccemere feld” in the Doomsday Book of 1086, and it was on this ancient domain that no less a personage than Henry VIII met Catherine of Aragon, his first wife. For two centuries Dogmersfield Park passed from father to son and from one generation to another. Then, like so many other large estates in England, Dogmersfield went into a sharp decline after World War II and was put to a variety of uses, from a school for girls to a home for Catholic priests. In 1981 a major fire gutted three quarters of the main house. Today the Four Seasons Hampshire is an award winning property for the discerning traveller and family suitable too. It is ideal for conferences and was the choice of Kia during our stay for a new car launch. The Koreans do this sort of thing in style. The elegant 170 capacity Ballroom is perfect for functions with its lovely terrace looking out towards the countryside. There are various other event rooms with lesser capacity. When it comes to dining the hotel has on offer Seasons, an elegant Anglo French restaurant, and a bistro. On Sundays the Farmers’ Market lunch is very popular with visitors, offering a huge variety of mouth-watering deserts. Local produce is on offer plus a Kids' Buffet. Including Champagne the all-inclusive price is £45. One of the hotel’s star attractions is its spa, set in the former stable block. Cleverly designed to fit in with the 18th century bell tower and gabled roof, the spa is contemporary, with clear, spare lines and an emphasis on pale woods and crisp limestone floors. Especially impressive is the soaring glass atrium over the swimming pool – from which guests can swim into a smaller outdoor pool and sample a whole array of water-massage treatments. At the end of a day’s therapy at the spa, pondering the dinner menu with a drink on the panoramic terrace, one may reflect that while the Georgian era had its points, the present moment in time has undoubted benefits, for both body and soul. If you enjoy walking, the grounds are undulating rather than hilly. The hotel offers two trails, one of two miles and another of four which takes you down to the Basingstoke Canal and the mooring of the Four Seasons own 56ft long canal boat, probably one of the most luxurious of its ilk anywhere in the country. The Queen’s Head in Dogmersfield village is another pleasant walk. 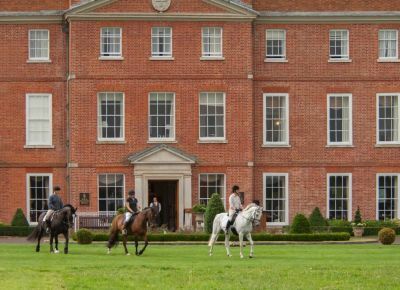 Also on offer is Clay Pigeon shooting, horse riding, falconry, tennis and course fishing. For golfing enthusiasts Wentworth is 30 minutes drive and Oak Park Gold Club just 10 minutes away. Just 10 miles and 20 minutes from the Four Seasons is The Vyne, a delightful 16th century country house, now owned by the National Trust and built for Lord Sandys, King Henry VIII's Lord Chamberlain. The house retains its Tudor chapel, with stained glass windows. The classical portico on the north front was added in 1654 by Inigo Jones's pupil John Webb. In the mid-18th century The Vyne belonged to Horace Walpole's close friend John Chaloner Chute, who designed the Palladian staircase, whose magnificent apparent scale belies its actual small size. During WWII it served as a school, its final owner Sir Charles Chute donating it to the nation in 1958. The grounds are really splendid and contain large woodland and a wetlands nesting site which is populated by swans and Common Redshanks. There are a number of woodland, wetland and parkland walking trails, including a family 'Woodpecker Trail' and a 'Living Sculpture' walk. Dogs are admitted only to the car park and Morgaston Wood. Each year a number of concerts, plays and family events are run. Twenty minutes from Dogmersfield is Chawton and the home of Jane Austen one of the most popular and important novelists that England has ever produced. The house at Chawton is where she spent the last eight years of her life. It is of international importance as the place where she did the majority of her mature writing including Sense and Sensibility (1811), Pride and Prejudice (1813), Mansfield Park (1814) and Emma (1816). 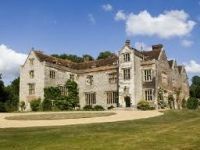 Also nearby Chawton House is a Grade ll listed Elizabethan manor house in the village of Chawton in Hampshire. It was formerly the home of Jane Austen's brother, Edward Austen Knight, and is now a library and study centre. The house has been extensively restored and is The Centre for the Study of Early English Women's Writing, 1600-1830, which runs study programmes in association with the University of Southampton. It incorporates Chawton House Library, opened in 2003, a collection of over 9,000 books together with related original manuscripts, formerly located in Redmond, Washington (USA).